In our articles on wave power we have only covered large scale generators built on an industrial scale. In this article we will present a simple miniature wave power generator which is easy to build and demonstrates many of the concepts used in commercial wave power generators. It is also an excellent educational project for children to learn more about generating electricity from renewable sources. 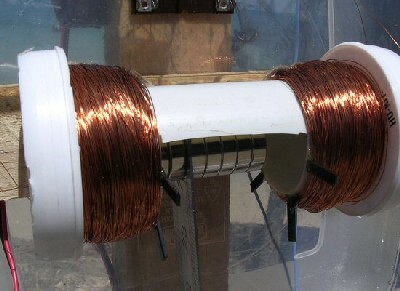 This wave powered generator generates electricity by moving magnets through coils of wire. There are a few high school physics concepts which you must know to understand how this generator works. 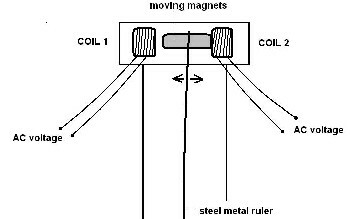 When a magnet moves through a coil of wire, an electrical current flows around the coil. If the magnet moves one way through the coil, the current will flow in one direction, and if the magnet moves the other way through the coil, the current will flow in the other direction. If the magnet moves quickly through the coil, a large current will be generated, and if the magnet moves slowly, a small current will be generated. While the magnet is stationary within the coil, no electricity will be generated. The magnitude of the voltage generated is proportional to the number of turns in the coil of wire – the more turns in the coil the higher the voltage. The schematic of the wave powered generator above shows the simplicity of this design. Stacks of magnets are stuck to the two sides of the end of a long steel ruler. The weight of these magnets together with the rocking motion of the waves causes the ruler to flex so that the magnets move in and out of the two large coils of wire. As the magnets go in and out of the coils, electricity is generated with one polarity and then with the reverse polarity. This is alternating current (AC) which is then rectified into DC voltage which can be used to charge a battery, or light some LEDs. You can also buy suitable bridge rectifiers instead of buying the diodes and making them yourself. Various wooden pieces and fixings – scrap wood is fine, for example old crates etc. The finished generator outputs a current of approximately 20mA at 5-6V DC, but the concept can easily be extended to make a more powerful and useful device – for example by using coils with more turns, bigger magnets, and something more flexible than the steel ruler to speed up the magnets through the coils. 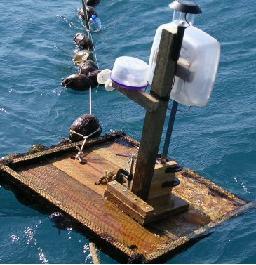 If you are interested in finding out how to make your own experimental wave powered generator then you will enjoy the following at the Creative Science website: Starting to Experiment with Wave Power.